1. Bone and Cartilage Regeneration – Cyfuse Biomedical K.K. Articular cartilage has poor self-regeneration ability because it has no blood stream, and once it is injured, the injury often progresses to become more severe. 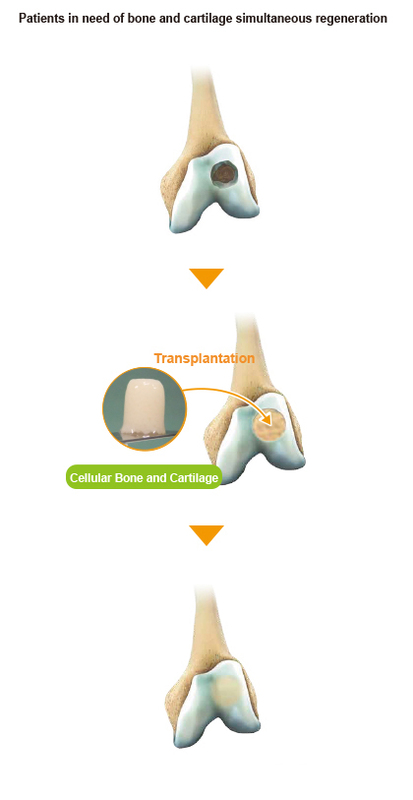 Conventional cartilage regeneration technology covered only the thin cartilage layer of the articular surface, and in the case where damage to the subchondral bone layer supporting the cartilage layer is injured,previous approach such as surgical therapies and symptomatic therapies, as well as artificial joint was selected. Under the suppor t of Japan Agency for Medical Research and Development(AMED), Cyfuse has developed a steric bone and cartilage structure consisting of the mesenchymal stem cells derived from the patient's own adipose tissue and is advancing development of a new therapeutic option of implantation of this bone and cartilage structure into the site of bone and cartilage loss. It is confirmed that the cell structure of bone and cartilage which is created without using scaffold (artificial scaffolding material such as gel) themselves gradually differentiated into cartilage and bone after transplantation into the site of loss in patients. Currently, Cyfuse is undertaking the clinical development under the support of AMED. Thus, as patients who have the subchondral bone degenerated because of the advanced cartilage defect, such as arthropathy, will improve their quality of life (QOL) after regeneration of the joint to recover not only the cartilage but also subchondral bone if possible,simultaneous bone and cartilage regeneration is greatly expected. From now on, Cyfuse is aiming to further advance the development of this cellular bone and cartilage, successfully regenerate normal articular cartilage that has been considered difficult before, and rescue a number of patients by the world's first breakthrough treatment method of simultaneous bone and cartilage regeneration.